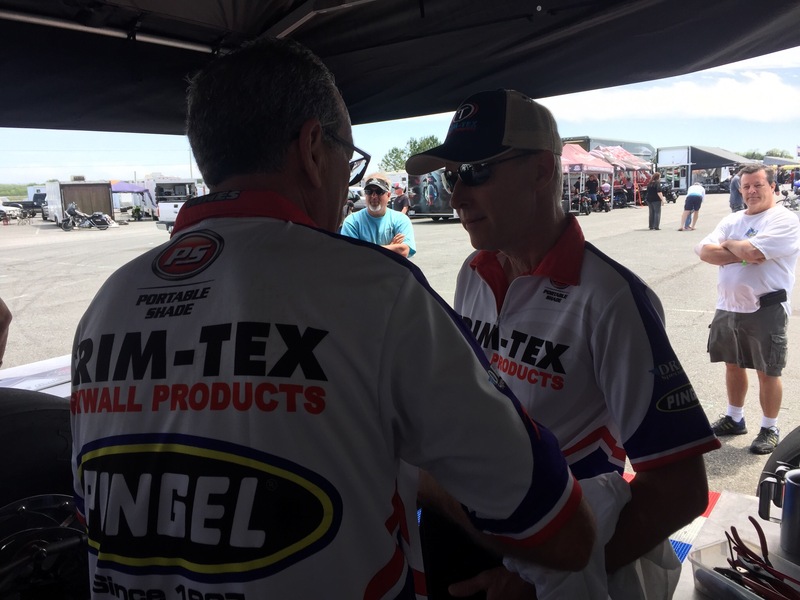 Drywall bead powerhouse Trim-Tex announces a personal sponsorship for rider Joey Gladstone in his first full year of NHRA Mello Yellow Pro Stock Motorcycle racing. 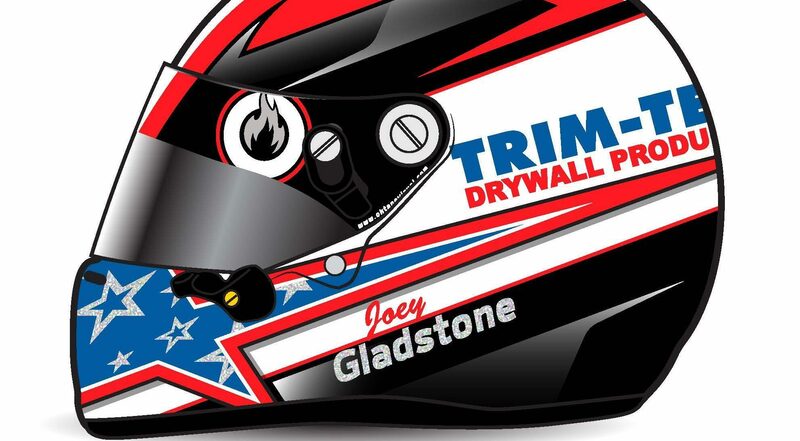 Joey will be showcasing a custom Trim-Tex helmet at all events in 2017. Koenig used to race Pro Stock Motorcycle himself, earning the nickname “7.0 Joe” with a record-setting pass in 2002 during AMA/Prostar’s “Mountain Motor” days. Koenig has also maintained a successful career as a sports car driver, racing in IMSA, SCCA, and NASA 25 hour endurance events. As team owner, Koenig carried the Trim-Tex banner to the NHRA PSM championship with rider Geno Scali in 2003 and the Indianapolis Motor Speedway winners’ circle with Brian Sellers and Mark Boden at the wheel of his BMW in the 2013 Brickyard Sports Car Challenge. 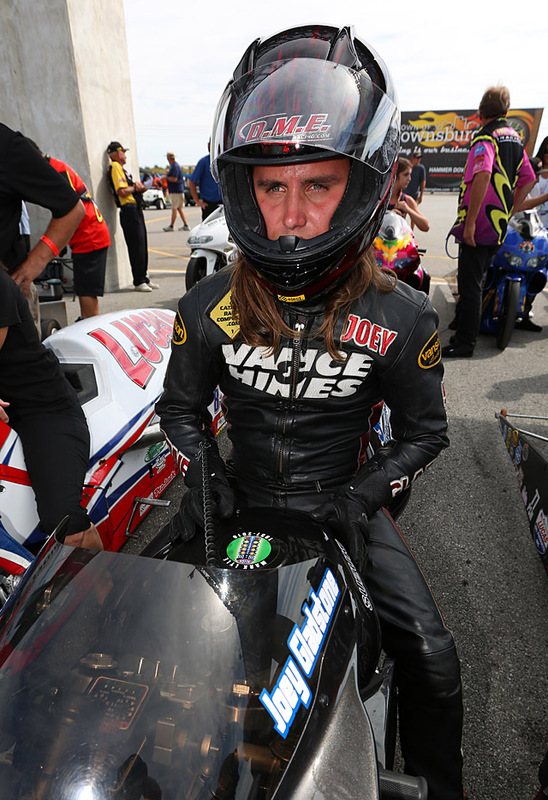 Trim-Tex sponsorship has long graced the side of Larry “Spiderman” McBride’s legendary Top Fuel Motorcycle, even more so since McBride debuted his new bike in 2016. Ryan Schnitz rode Rob Muzzy’s Pro Stock Motorcycles (first a Buell, then a Kawasaki ZX14 ) from 2006-2008 with Trim-Tex livery. 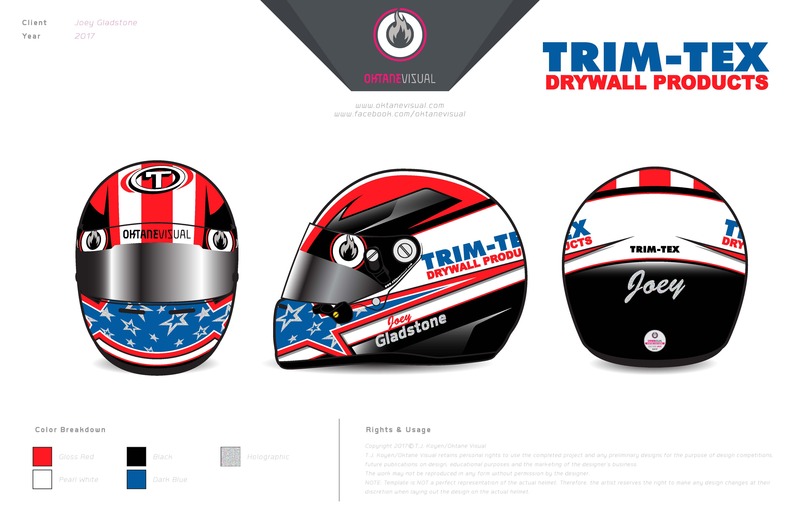 And Trim-Tex also adorns the helmet of young sports car star Trent Hindman, the 2014 Continental Tire SportsCar Challenge GS champion and co-driving winner of this year’s four hour Continental Tire SportsCar Challenge race at Daytona. 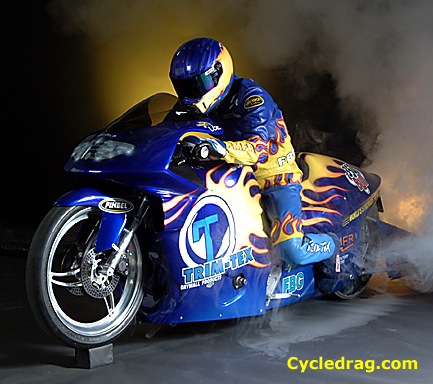 Gladstone became a household name in motorcycle drag racing on DME Racing’s 700 horsepower, turbocharged, Pro Street Suzuki Hayabusa, totaling eight championships in four years. Starting in Supersport and advancing to Real Street—with occasional grudge races, 4.60 index, and one other quick dip into Pro Stock—the fully rounded rider that Gladstone is was formed. 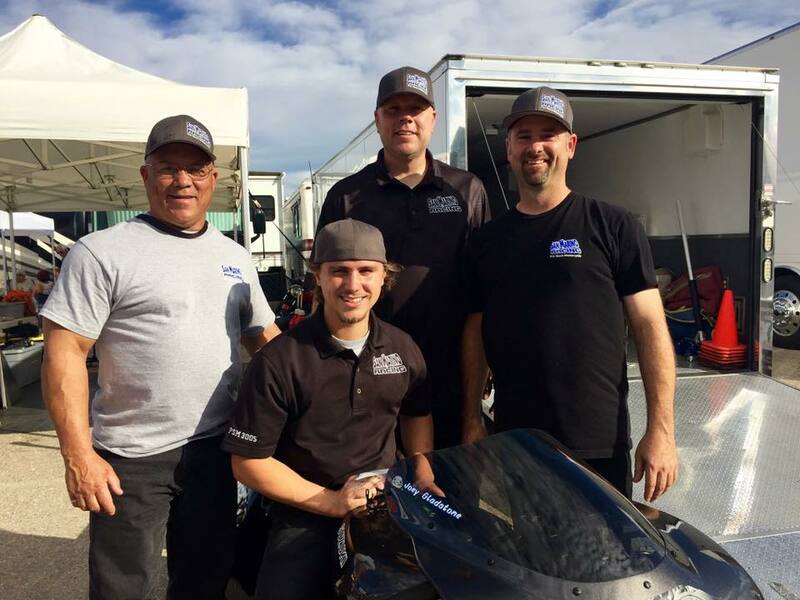 Joey Gladstone and Joe Riccardi ready to run the full 2017 NHRA PSM season. Everyone at Trim-Tex believes in the philosophy “Work hard, play harder” and that is why we love motorsports so much! Good luck and safe travels to all our racers! Joey Gladstone thanks Joe Koenig and Trim-Tex http://www.trim-tex.com/ , Eddie Krawiec and everyone at Vance & Hines http://vanceandhines.com , San Marino Excavating http://www.sanmarinoexcavating.com , Suzuki Extended Protection https://www.suzukisepdirect.com , Underdahl/Stoffer Racing, Kustom Machine http://www.kustom-machining.com/ , Eight Mile Signs http://eightmilesigns.com , Northeast Ohio Dyno, Pingel Enterprise http://pingelonline.com/ , Manitoulin Chrysler http://www.manitoulinchrysler.com , and his family. Have the team shirts ready for sales at the Gators!